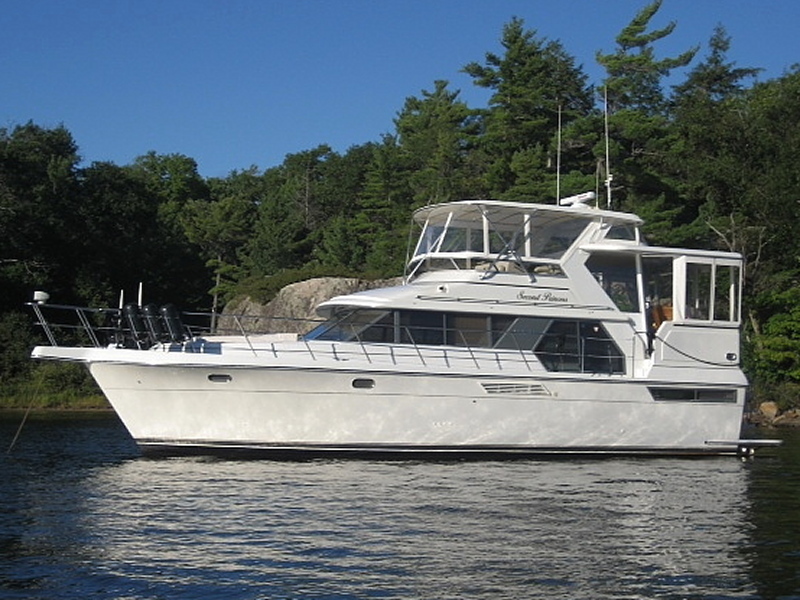 The Carver 440 Aft Cabin Motor Yacht is ideal for family cruising, and it provides enough privacy for two couples to enjoy an extended cruise. At almost 48’ overall, she has the interior space of today’s fifty-footers – and for a fraction of the cost. Aft and forward staterooms provide maximum separation and each cabin has en-suite access to a head with a stall shower. Need more accommodation? With the salon sofa bed and convertible dinette, up to seven adults can sleep comfortably. The salon is spacious and open with a built in entertainment centre, comfortable L-shaped lounge and large side windows that actually open for a cooling breeze. Meal preparation is a breeze three steps down in the well-equipped galley complete with 3-burner stove with oven, a full-size fridge and dishwasher. A large dinette opposite the galley offers comfortable U-shaped seating for meals, and can double as a convenient computer desk/workspace at other times. Exterior accommodations are equally well designed with careful attention to form and function resulting in attractive bridge and aft deck layouts that really work. Fore and aft visibility from the hardtop bridge is exceptional, with a wrap-around, centre-line helm equipped with a great array of navigation electronics. Additional bridge seating can safely accommodate up to six guests in comfort. The large enclosed aft deck, with comfortable wicker furniture and a well equipped wet bar, is a great spot for early morning coffee or an early evening cocktail with friends. A spiral staircase leads down to a swim platform with a storage box for water toys, and a power assisted lift that allows the dingy to be stored upright without consuming a great deal of platform space. This Great Lakes freshwater Carver 440 Aft Cabin is equipped with the much sought-after Cummins 420C (8.3L) Diamond Series diesels, each delivering 420hp. These C-series diesels are known for their fuel economy, dependability and low maintenance overhead. With only 880 hours on the meters, they are barely broken-in, making this an excellent choice for anyone planning extended cruises, or simply looking for a low-cost waterfront cottage. Be sure to give this one a good look!